Aliphatic nucleophilic substitution clearly involves the donation of a lone pair from the nucleophile to the tetrahedral, electrophilic carbon bonded to a halogen. We might expect this carbon to be electrophilic because of the halogen attached to it. For that reason, it attracts to nucleophile. However, the mechanism of the reaction might happen in a couple of different ways. Compare the electronegativity of carbon to that of fluorine, chlorine, bromine and iodine. a) On this basis alone, explain why the carbon attached to the halogen would be electrophilic. b) Which compound should be most electrophilic based on electronegativity: fluoromethane, chloromethane, bromomethane or iodomethane? c) Use the following bond strengths to estimate the qualitative trend in activation barriers for nucleophilic substitution in the four compounds in part (b): C-F 115 kcal/mol; C-Cl 84 kcal/mol; C-Br 72 kcal/mol; C-I 58 kcal/mol. d) Fluorocarbons are quite stable towards aliphatic nucleophilic substitution; in general, they do not undergo this reaction. Explain why. In considering possible mechanisms for this reaction, we ought to think about overall bond-making and bond-breaking steps. In the addition of sodium cyanide to alkyl chloride to make an alkyl nitrile, there is one bond-making step (the C-C bond) and one bond-breaking step (the C-Cl bond). The simplest reaction mechanism would involve some combination of these steps. The C-C bond forms and then the C-Cl bond breaks. The C-Cl bond breaks and then the C-C bond forms. However, some familiarity with bonding in the second row of the periodic table may suggest to you that mechanism A is not very likely. That mechanism would require forming five bonds to carbon before the C-Cl bond eventually breaks. We can safely ignore this possibility. Instead, there may be a third possibility to consider. The C-Cl bond breaks and the C-C bond forms at the same time. Mechanism C is a concerted mechanism; two bond-making and -breaking events happen at once. However, no octet rules are violated. 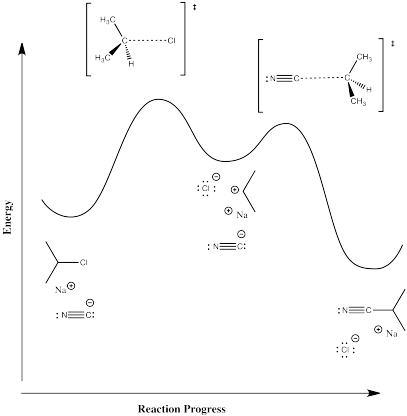 Reaction progress diagrams for these two reactions would look like the illustrations below. There isn't necessarily a reason to believe that mechanism B is the correct mechanism and mechanism C is the wrong one, or vice versa. Either one may be possible. You may need to do some work in order to figure out which one really happens. Some experiments may help to highlight what is going on. 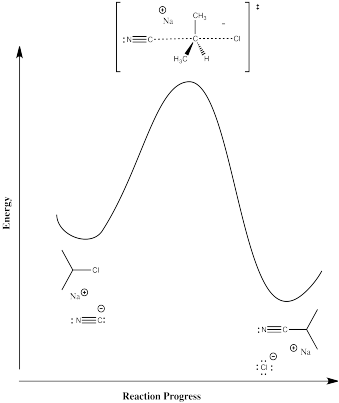 If charged intermediates are suspected along a reaction pathway, insight can sometimes be gained by running a reaction in a more polar solvent and comparing its rate to that of the reaction in a less polar solvent. a) Are charged intermediates present, either in mechanism B or C? b) Explain how each of these mechanisms might behave in a more polar solvent. Sometimes, a distinction between two possible mechanisms can be gained by comparing rate laws expected from each mechanism. a) What do you think is the likely rate-determing step in mechanism B? b) What do you expect will be the rate law for mechanism B? c) What do you think is the likely rate-determing step in mechanism C? d) What do you expect will be the rate law for mechanism C?